For the fair weather soccer fans that can only get up for the game when its time for the World Cup (as long as the US is in it), the quadrennial event now taking place in Brazil is top of mind. But for those involved in the sales of R+W Couplings, this also marks the time for the International Sales Meeting in Germany. As DieQua’s Director of Sales and Marketing, I traveled to the June 12-14 conference. 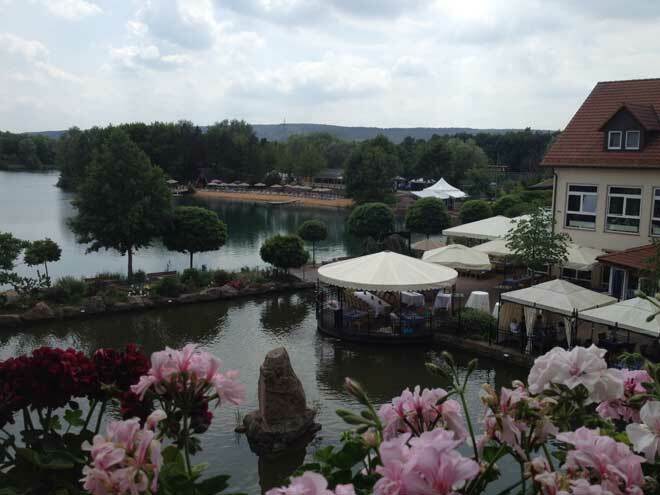 Held every 4 years, this one for the second time in a row at the Seehotel in Niedernberg, the event was an opportunity to rekindle old relationships and develop some new ones. Almost 60 participants from most of the 45 countries where R+W operates attended to see the latest developments and to witness any changes since the acquisition of the company by the holding company Poppe + Potthoff, which specializes in automotive components. Change was a major theme of the Executive and Technology Days as the event was called. The topics were not only about change within the R+W organization but about how to change our strategies and tactics in the sales of couplings as well as how to change our own behaviors for improved productivity and teamwork. Most of the changes within the organization were rather transparent as the company continues to manufacture the world’s finest metal bellows and elastomer insert shaft couplings. What was apparent was the increase in capital investment to support steady growth and the systems put in place to support their worldwide sales partners. Typical of these meetings were the variety of welcome speeches and the introduction of new products, such as a stainless steel insert for the jaw couplings and a review of the new disk pack and gear couplings. What wasn’t typical was a couple of the team building exercises the attendees engaged in. The first revolved around Web 4.0 or The Internet of Things. For our purposes this is basically the integration of operations and communication through the web. The attendees were broken down into 8 groups and were tasked with coming up with new “smart” coupling products that could use the developing web technologies to do other things than just transmit torque between two shafts. The ideas were the important thing. Figuring out how to make them work was obviously beyond what any of us were capable of. There were a number of tremendous concepts presented, many of which revolved around integrating sensors and communication devices that could transmit coupling or application performance data. My group’s contribution was the unique idea of ceasing the production of couplings and selling and transmitting the programs directly to customers to 3D print couplings, thereby eliminating all production costs. 100% profit! Its obviously a far fetched concept, but not out of the question sometime in the future. The second day’s exercise was designed for personal development and was prefaced by a wonderful speaker identifying and explaining the 4 Cs of change. The first was to choose your attitude. There are a whole host of experts and quotations that conjecture it’s not what happens to you but your attitude about it. The four stages of change are repression, resistance, acceptance then commitment. The second C was to take action, followed by the 3rd, choosing to let go of the past and then the 4th, choosing to make the new behavior a habit. The main take away was to make small achievable changes more often and that small changes over time can yield big, long term results. The groups then reconvened to develop strategies for change that they could take back home with them to impact their individual organizations. It was amazing to realize that many of the same issues and thought processes were common around the world. Although cultures have differences, business is still business. This meeting was not all business, however. Along with the first night welcome reception there was a variety of activities to entertain on the final night. Taking a cue from the concurrent World Cup, there was a soccer tournament between the groups. The style of play was a bit convoluted and designed for minimal possibilities of injury, although there was one. Bubble soccer was a strange game and not for the claustrophobic. But it was fun to try once. To keep everyone moving to the beat a Brazilian dance group, reminiscent of Carnival, provided visual and audio stimulation. To complete the reference to the world’s most popular game’s crowning event a wonderful Brazil barbecue was offered to the masses with a wide variety of meats, side dishes and deserts that had everyone bursting at the seams.